This thread is for live updates and comments regarding The Rolling Stones No Filter show #2 at London Stadium UK 25-May-2018. Please tell us your pre- and post-show thoughts and comments here. Edited 1 time(s). Last edit at 2018-05-25 10:12 by bv. very much looking forward to this evening's show. First one in 5 years. Also intrigued to see Florence. Last saw her 4-5 years ago on the undercard at a festival. It'll be interesting to see her bands progression since the early days. Edited 1 time(s). Last edit at 2018-05-25 10:21 by Adrian-L.
Last show of this amazing 10-day trip. Tripled my Lucky Dip chances (last minute). Going to pick up the tickets (my own pair) at about 2pm. Pre-show meal somewhere around Westfield. Might try the Brazilian joint next to The Cow. Have a great show, folks! Trusting you will have a great time, Adrian. Bit disappointed that i wont be visiting London this time around,and meeting up with some old friends, but due to the fact they are playing a bit nearer home for the first time in 30 odd years < Coventry > i would have been going tonight. Would have been nice to have visited the stadium as well. Exciting, have a great time everyone! Come on, sleepy London town needs another weak up from these old men tonight! Saw Florence on stage with them in Nov 2012 at the second O2 gig, I liked that Gimme Shelter, tight and a bit different. Can't wait! It's the same for me first show since the o2 in 2012. I would love to meet up with other iorr folk b4 the show. Another possible pub is Tap East [www.tapeast.co.uk] for all the beer lovers. I have been staying all week right here in the center of Stratford and it is a great place. 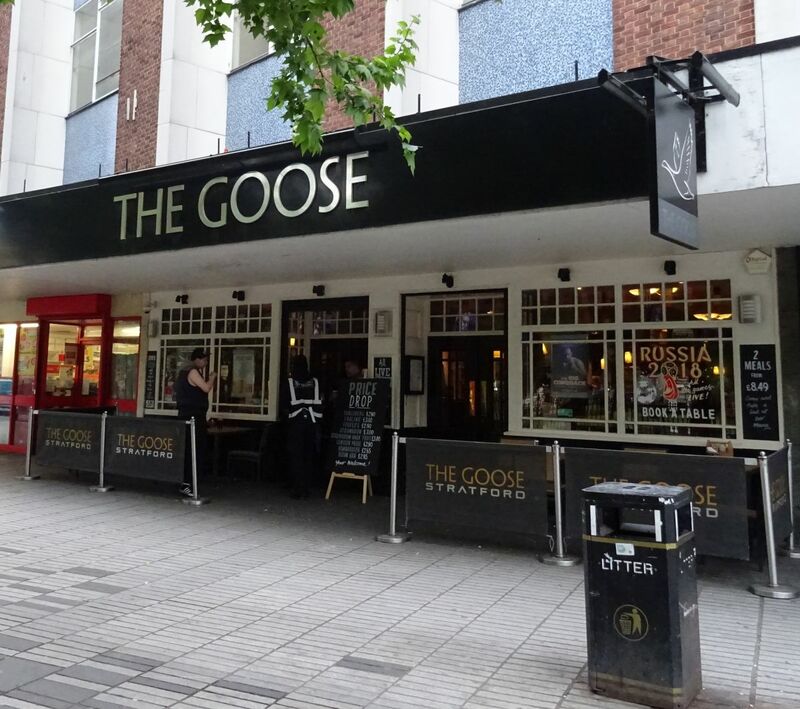 If you arrive by Central Line or train to Stratford station just walk all the way through the Stratford Centre across the street, then turn left, the Goose is by the Church. Or walk left before you enter the Centre, it is a much nicer walk then. Edited 1 time(s). Last edit at 2018-05-25 13:13 by bv. Not a beer OR chips lover here. Hung out at The Real Greek at Westfield on Tuesday. Trying something else today. Will be at Busaba Thai from 3pm onwards. Edited 1 time(s). Last edit at 2018-05-25 14:24 by Topi. Good plan. We did that on Tuesday. Great food and Amazon beer! ...got my LD recently, General Admission only, but I'm very happy. It's great to meet so many Stonesfans! Much fun to everybody in London . Edited 1 time(s). Last edit at 2018-05-29 09:43 by DocChill. On my way ... Have a good time everyone - the Stones are back in town so I intend to! Have a GRRReat concert, Green Lady and everybody who are in London! Edited 1 time(s). Last edit at 2018-05-25 19:02 by Cristiano Radtke. Gold rings to everyone, have a great time. Hope the weather is good for you. Have the best night, all IORRians...here's to a blinding show!